ALBUQUERQUE, N.M. — A perpetual quest of manufacturers and viewers is for ever-brighter colors and better images for flat-panel displays built from less expensive materials that also use less electricity. 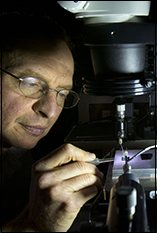 An intriguing method discovered by Sandia National Laboratories researcher Alec Talin and collaborators at the Center for Nanoscale Science and Technology at the National Institute of Standards and Technology in Bethesda, MD, may be that next step. It uses super-thin layers of inexpensive electrochromic polymers to generate bright colors that, for the first time, can be rapidly altered. The work was reported in the Jan. 27 Nature Communications, and was funded by the University of Maryland’s Nanostructures for Electrical Energy Storage, an Energy Frontier Research Center of the Department of Energy. Electrochromic polymers by themselves are not a new invention. They change color in response to an applied voltage and only require energy when switched between colored and transparent states. But until Talin and his collaborators, no one had figured out how to switch electrochromics on and off in the milliseconds required to create moving images. The problem lay in the thickness of the polymer. Conventional electrochromic displays require thick polymer layers to obtain good contrast between bright and dark pixels. But thick layers also require long diffusion times for ions and electrons to change the polymer’s charge state, making them only useful for static information displays or darkening windows of a Boeing Dreamliner, not in the milliseconds needed for an action flick or even a roundtable discussion. On top of that, a full color display requires three different polymers. The researchers got around the rapidity problem with a tiny but spectacular innovation: They created arrays of vertical nanoscale slits perpendicular to the direction of the incoming light. The slits were cut into a very thin aluminum track coated with an electrochromic polymer. When light hit the aluminum nanoslits, it was converted into surface plasmon polaritons (SPPs), which are electromagnetic waves containing frequencies of the visible spectrum that travel along the dielectric interfaces — here, of aluminum and electrochromic polymer. The distance between the slits in each array (pitch) corresponded exactly to the wavelengths of red, green and blue light. The pitch determined which wavelength — red, blue or green — was transmitted down through the array, traveling along the interface between the thin polymer layer and the aluminum substrate. Because the polymer was just nanometers thick, it required very little time to change its state of charge and therefore its optical absorption of colored light. However, because the light traveled a relatively long distance along the surface of the aluminum slits coated with the thin polymer, it saw a much thicker polymer layer. The material turned a desirable deep black when a tiny electric current sent across the top of the slit cut off the entering light, and did so in milliseconds. When the current was flicked off, light frequencies passed through the slits and instantly turned on the pixel. As an additional bonus, because the carefully spaced slits let in light only at a particular frequency, a single kind of polymer coating served as a neutral party to deliver all three emanated colors. "These very inexpensive, bright, low-energy micropixels can be turned on and off in milliseconds, making them fit candidates to provide improved viewing on future generations of screens and displays," said Talin. "The nanoslits improve the optical contrast in a thin electrochromic layer from approximately 10 percent to over 80 percent." Sandia National Laboratories is a multi-program laboratory operated by Sandia Corporation, a wholly owned subsidiary of Lockheed Martin Corp., for the U.S. Department of Energy’s National Nuclear Security Administration. With main facilities in Albuquerque, N.M., and Livermore, Calif., Sandia has major R&D responsibilities in national security, energy and environmental technologies and economic competitiveness. "The nanoslits improve the optical contrast in a thin electrochromic layer from approximately 10 percent to over 80 percent."